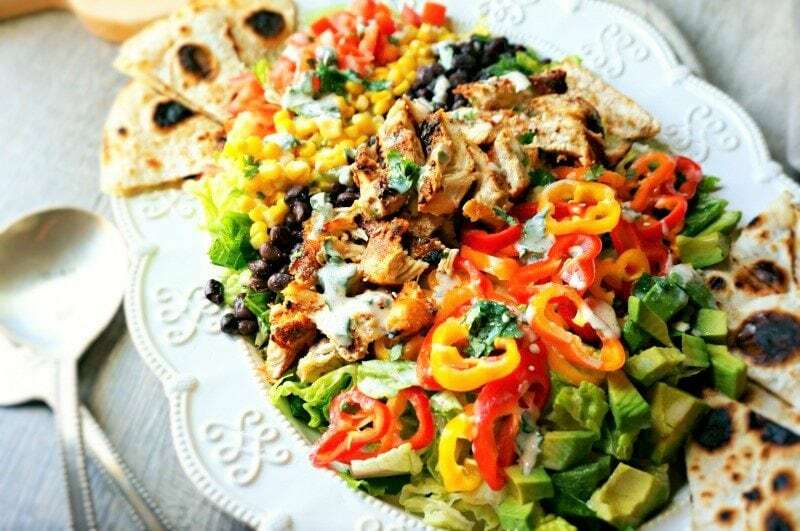 Southwestern Chicken Cobb Salad: A southwestern spin on a classic cobb salad–crisp romaine is topped with corn, avocado, tomatoes, peppers, grilled chicken. Served with cheese quesadillas in place of croutons and completed with a Cilantro Lime Dressing. People often ask me how I get my kids to eat healthy. And I always answer them with the same 3 Things. Make healthy eating fun. This can be turning a banana into a healthy sundae, making a healthy dip for fresh produce to adding a favorite food to a dish they may be skeptical to try. I don’t give them choice. Sounds harsh! But in reality I just mean I stock a pantry and fridge full of healthy options. They don’t have processed chips and cookies to choose as a snack, they have homemade granola bars, fruit, or nuts to choose from. I also make one meal. If the kids don’t like it, they get to make themselves a plain bowl of oatmeal–not very enticing, but does keep them from starving and feeling forced to eat something they genuinely don’t like. PS the same rule goes for the parents! So let’s talk a little bit more about tip #2: Making Healthy Eating Fun. There are all sorts of ways to make eating healthy fun. I mentioned few, but let’s expand this idea a bit. At times, I make a healthy soup and then top with a cheesy crouton–because who can resist cheese?! Other times I might sneak in a few veggies into a smoothie and call it a Frankenstein Smoothie, or sneak flax seed into a decadent tasting oatmeal–like this Hot Cocoa Oatmeal. One of my best tips to getting kids to eat more salads, is to add an element they can’t resist. I love to put fries on a Buffalo Chicken salad–which honestly, is one of my kid’s favorite meals of all time. And recently, I hit the jack-pot by adding cheese quesadillas to my Southwestern Cobb Salad. The kids and my husband LOVE cheese quesadillas, so they thought to have this on top of a salad was, and I quote, The coolest thing EVER! Well if a cheese quesadilla was going to get them excited about eating salad, who was I to argue. Okay, it got me excited too! This tex-mex cobb salad is truly spectacular. It is filled with fresh produce, from diced avocados, crisp romaine hearts, baby peppers (hint: they are sweeter and tiny, so kids seem to love them in my experience), corn, black beans, fresh tomatoes, and grilled chicken. Then it is finished with a light and fresh lime and cilantro dressing that marries all these flavors together perfectly. Make this Cobb Salad meatless, by adding more beans and omitting the chicken. If you don’t like cilantro–make a homemade ranch dressing and add a bit of homemade taco seasoning for a Homemade Southwest Ranch Dressing. Add any veggies or beans your family likes to this Cobb Salad. Leave out the corn, add more corn, add fresh tomatoes or omit the tomatoes. You get the idea. 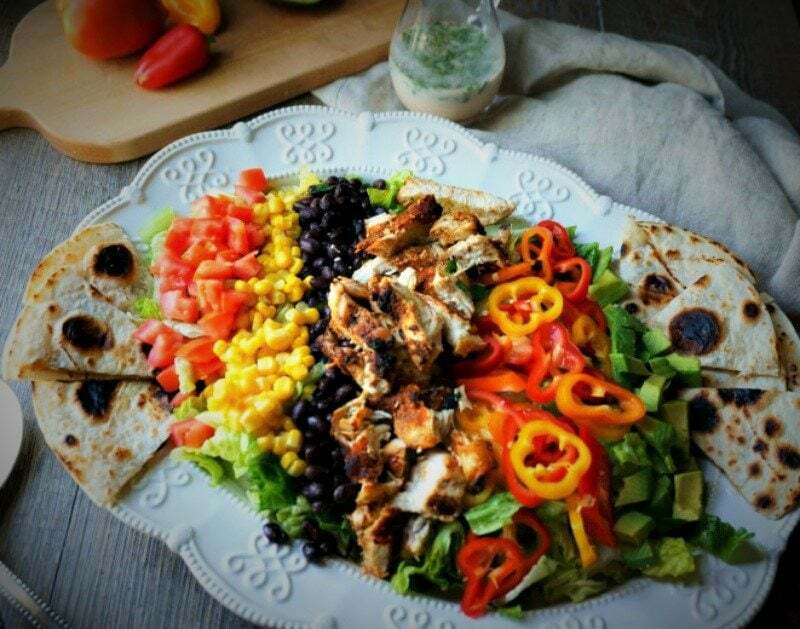 Make your cheese quesadillas with corn tortillas for a Gluten Free Southwestern Cobb Salad. You can leftover Rotisserie Chicken or 3 Ingredient Taco Meat for an even easier version of this Mexican Taco Cobb salad as well. 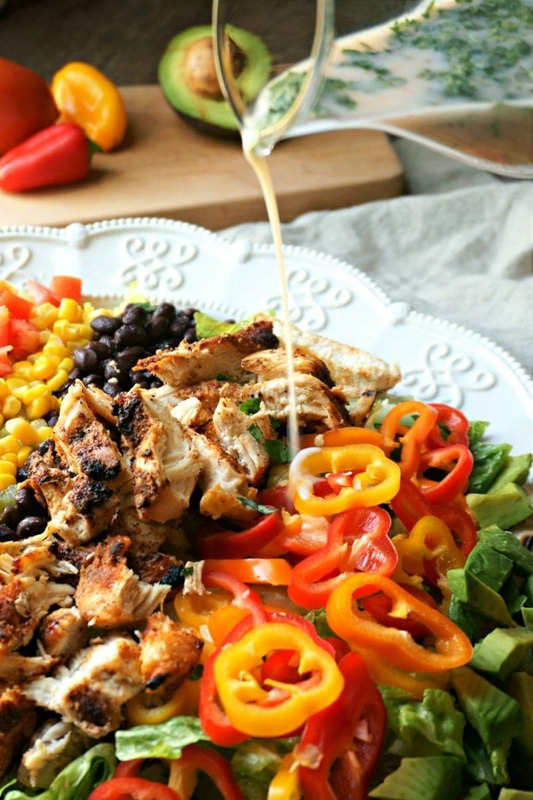 So make up this Southwestern Chicken Salad and I bet your kids will be begging to eat their veggies. Check out this Harvest Cobb Salad or Cajun Cobb Salad for additional fun spins on Cobb Salad Recipes. A southwestern version of a chicken cobb salad with black beans, corn, tomatoes, tex-mex chicken, and a cilantro lime dressing. Pound chicken out to 1/4 inch thickness. Rub taco seasoning over raw chicken. Grill or broil chicken for 4-5 minutes per side, or until chicken reaches 165 degrees. While grilling chicken, place one tortilla on indirect heat on grill. Top with shredded cheese and remaining tortilla. Cook for 3-4 minutes per side, or until cheese is melted. On a large platter, lay out the romaine hearts. Top with the beans, tomatoes, corn, peppers and avocado. Slice the chicken and top salad with cooked meat. Slice quesadilla into wedges and serve alongside salad. Whisk all ingredients together and serve with salad. Kristen, you don’t have to tell me twice – this salad surely is spectacular! I LOVE your twist on the classic cobb salad and I LOVE your use of tortillas instead of croutons as I abhor croutons! Thanks Shashi!! #3 is indeed crucial! Oh, this salad looks fantastic!! I’m making a southwestern inspired tossed salad for guests this weekend and hope it turns out as wonderful as yours!!! I bet yours will be fabulous Liz. Always on the quest for new chicken salad recipes- love this one! This is a good one for sure! I’m in the “love cilantro” category! This salad and dressing is right up my alley! Then you will LOVE this dressing for sure Cynthia! Love this bright beautiful deliciously healthy salad! Thanks for linking up on #FoodieFriDIY – came by to do some sharing and to let you know I’m featuring your recipe this week! Come back and share again – we sure love your blog! Absolutely delicious! My family loved it. I love that it has the Mexican food flavors, but yet very different. My limes were bad, so I improvised and made a salsa ranch dressing instead. I am wheat-free, so I made corn quesadillas instead of flour. YAY!! I love to hear your family enjoyed this Raquel. And great swaps–we often use corn tortillas ourselves. And I love the sound of your salsa ranch dressing. The instructions for the chicken are great, I have made chicken again this way several times after initially making this recipe. My family found the dressing extremely strong and it sorta ruined eating the salad as we found out after we had already dressed the salad. I would much prefer Chipotle ranch or something creamier and less acidic.